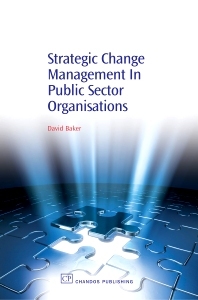 This book covers all the major aspects of change management for those working in public sector and not-for-profit organisations. It summarises key theories and approaches to change management and includes detailed, worked descriptions of key techniques used in change management processes and programmes, with extensive reference to case studies drawn from a range of public sector, not-for-profit organisations and other environments. Introducing change and strategic change management; Structure and culture; Building blocks; Roles and responsibilities, partners and players; Learning for change; Strategy development; Route mapping for change: Techniques and tools; Programme and project management; Summary. Professor David Baker has published widely in the field of Library and Information Studies, with eighteen monographs and over 100 articles to his credit. He has spoken worldwide at numerous conferences, led workshops and seminars. His other key professional interest and expertise has been in the field of human resources, where he has also been active in major national projects.